Making time for cooking let alone blogging (about it!) has become a herculean task with my 7 month old kid. That should explain my infrequent blogging. In the meantime I have been looking up other food/photography blogs and chatting with my friends regarding my new found love for food blogging. An old school friend of mine who had a look at my blog suggested that i try out banana stem – cucumber juice which he had in dubai. Though he said it tasted good, i could not accept that banana stem (vazhathandu in malayalam) could taste good. However, I decided to give it a shot and made it with a few alterations and contrary to my expectations it tasted good and was extremely refreshing (my husband stands testimony to this). It is a drink which all weight watchers can have, since banana stem is a rich source of fibre and helps in weight loss. Banana stem is known to be bitter in taste, however combined with cucumber it gives a mildly sweet taste. I added about 2-3 tsps of sugar which can be avoided if you do not have a sweet tooth. Slit the cucumber into two, deseed it and chop it into medium sized pieces. Chop the banana stem into medium sized pieces and grind in the blender along with ¼ cup of water. 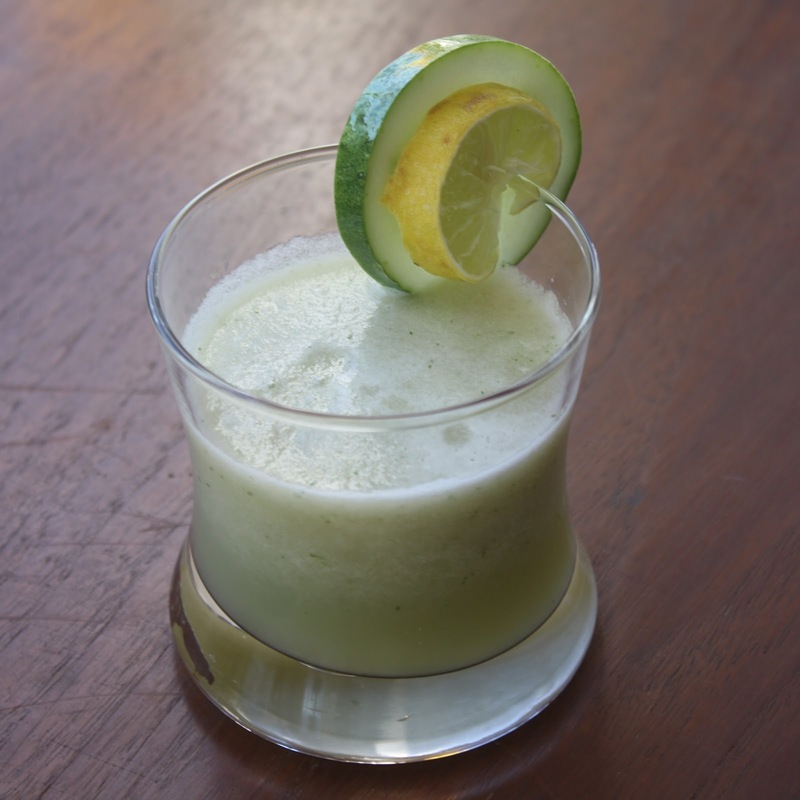 Strain it and blend this juice along with frozen cucumber pieces, mint leaves and sugar.